I know I’ve been on a muffin kick lately, but it’s just another attempt to ensure that I don’t skip breakfast. Don’t get me wrong. I don’t whip up a batch of muffins every morning. But a batch of 12 baked in the evening will ensure my breakfast for the next 3-4 days, as well as an evening snack once in a while! Another trick I tried a few days ago, for a more regular breakfast, was Baked Oatmeal. Although I loved it, the muffins win over it because (a) less effort on a daily basis and (b) it’s summer and a hot breakfast is NOT my first choice! To be honest, this batch of Banana Bran Muffins was perpetuated by the sad overripe bananas in my fruit basket. AK lives on banana milkshake, specially when he’s in his fitness mode – every run/ cycle/ gym session has to be followed by a tall glass. So my fruit basket is always full of too many bananas, more than we can finish in time! So the next time you have leftover bananas, do try this. I promise you won’t be sorry! I turned on the oven at 180 C to pre-heat and proceeded to prepare the muffin tin. I had only brown striped muffin liners left and I was bored of them. So I decided to try the parchment paper approach (using butter paper instead). I found a few tutorials online and proceeded to cut out 12 pieces of paper, approx 5″ x 5″ squares. Greasing the cups slightly (this helps the paper stick), I placed a square over the cup and pushed down with a bottle of lemon tea syrup and twisted it to crease the sides! 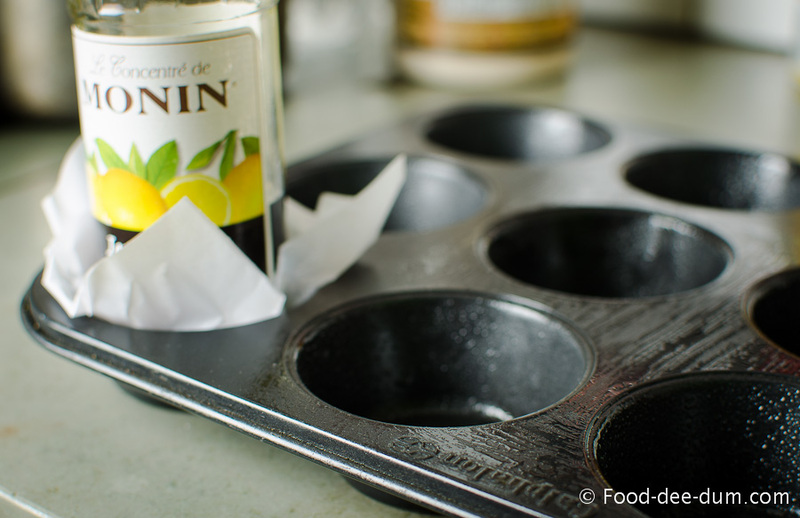 You should use a glass/ cup/ bottle which is approximately the same size as the muffin tin so that the base will be the correct diametre. 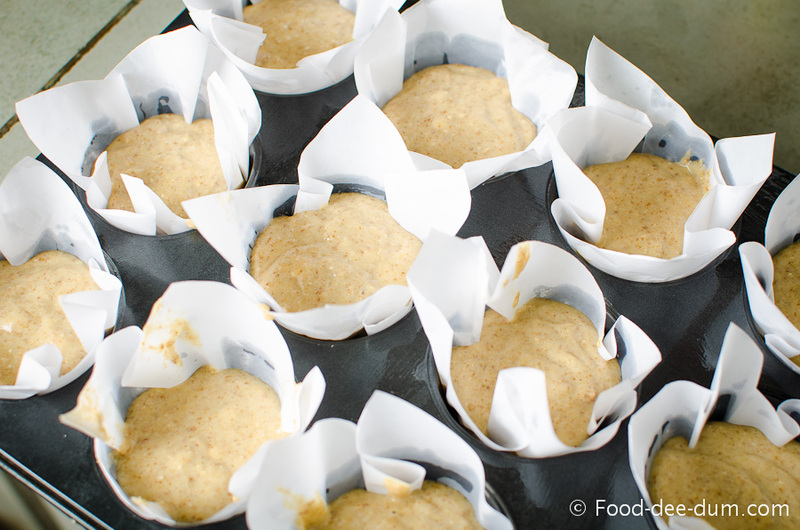 Using my fingers, I pressed the creases around the bottle so that the make-shift liners would stick to the cup edges and avoid any free space or gaps through which the batter could flow out – sticking paper into the middle of the muffin! Once they were powdered, I added in the flour, baking soda, baking powder and salt and gave it all a quick whizz to mix everything up. Then I added the wet ingredients to the dry and mixed to combine. I added in the nuts and gave everything one final stir. Then I popped them in the oven for 15 minutes. When I checked them, they could still use a little more baking so I lowered the heat to 150 C and gave them 2 more minutes. Here they are, fresh out of the oven! It was such quick recipe with hardly any prep involved and the muffins turned out nice and soft, even when cooled. 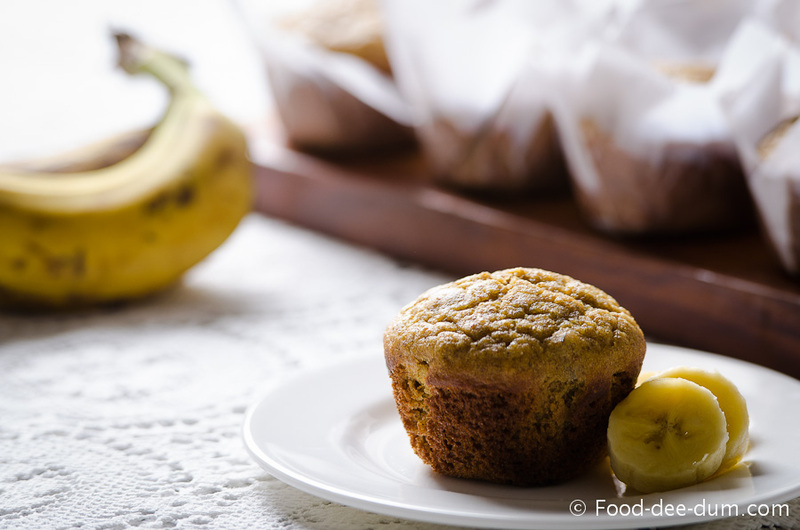 Bananas have that effect on muffins! Although I was happy with the oat & bran addition, AK couldn’t tell, which was lucky for me! But he did ask me if I had forgotten to add any sugar! I solved the problem by buying him a jar of strawberry jam which he happily slathered all over the muffin before having it for breakfast this morning! He also had one with fresh chopped mangoes and vanilla ice-cream last night for dessert! At this rate, I doubt this batch will last the 3-4 days I was expecting it to! But that’s a good thing, I think. If you don’t want to go the healthy route, you can use 2 cups of all-purpose flour, or 2 cups whole wheat for a “slightly” healthier version and omit the oats ad bran altogether. You can also taste the batter and add more sugar if you like. 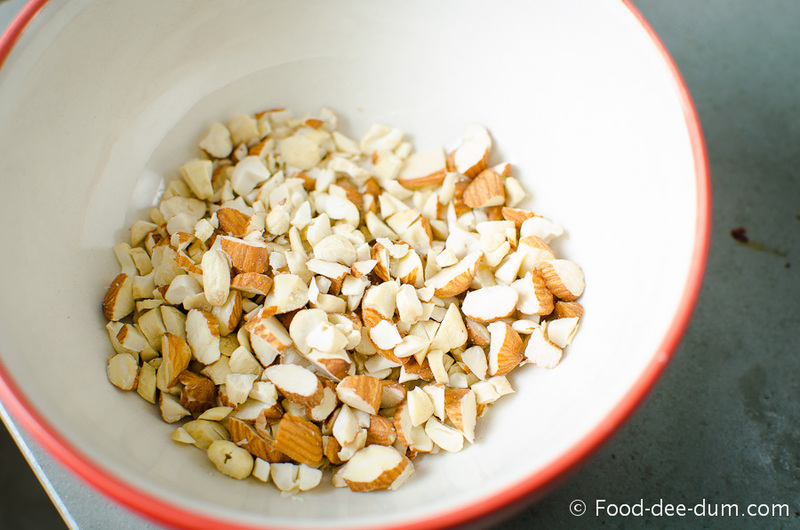 Other variations you can try are adding 2 tbsp of dried dessicated coconut to the dry ingredients. Or a tsp of cinnamon. They would both go extremely well with bananas and maple/ honey. This recipe has also been featured on Archana’s Kitchen. 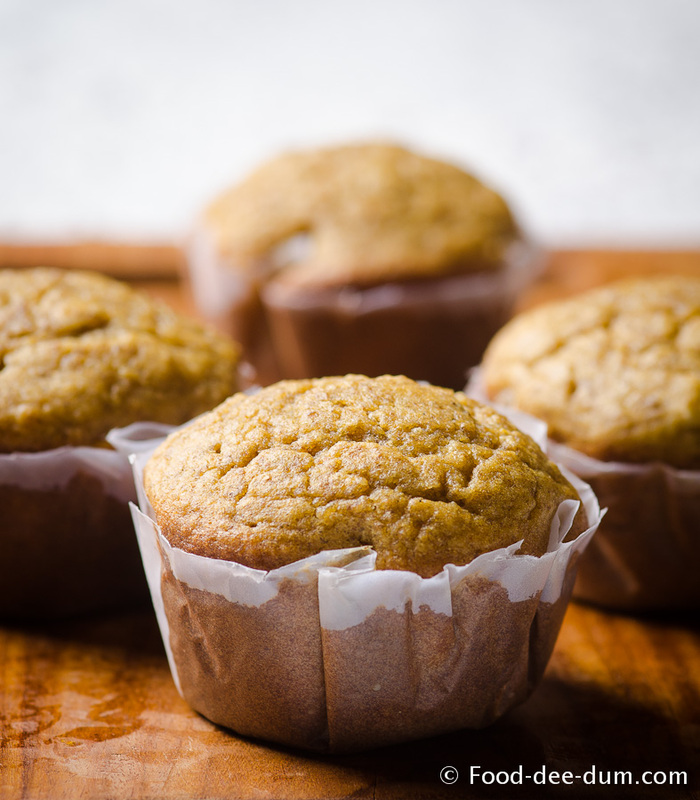 Quick & easy banana bran muffin recipe - one batch could potentially take care of your breakfast for a week! Pre-heat your oven to 180 C and place the rack in the middle of the oven. 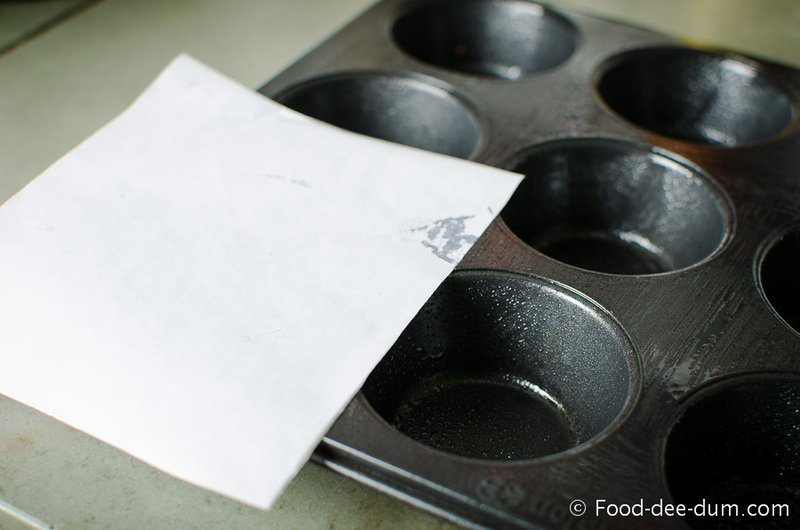 Line your muffin pan with paper liners or parchment paper and lightly grease them. 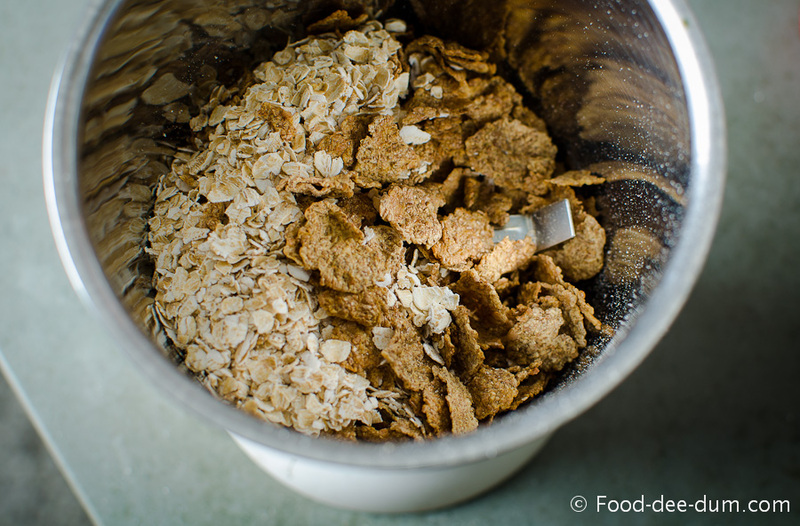 In a mixer-grinder, powder the oats until they resemble fine meal. (You could even simply use oat flour but I usually just have oats in the house and I powder them). 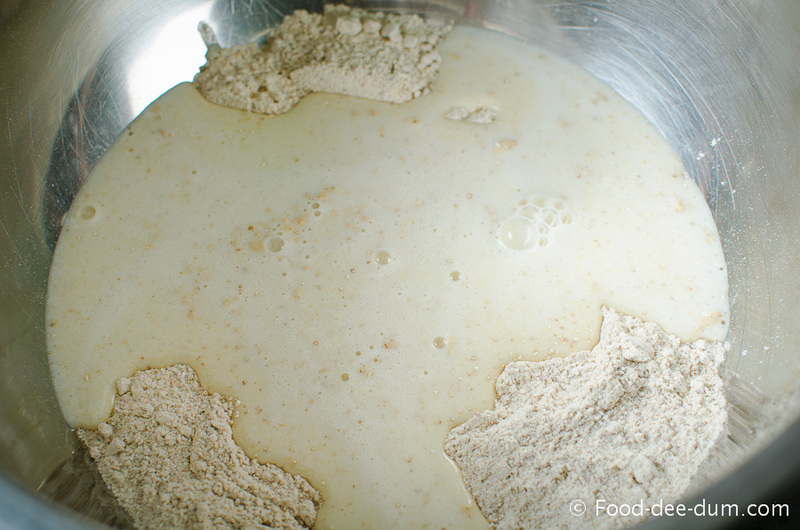 In the same jar, add the flour, wheat bran, baking soda, baking powder and salt and give it a quick whiz to mix them up. 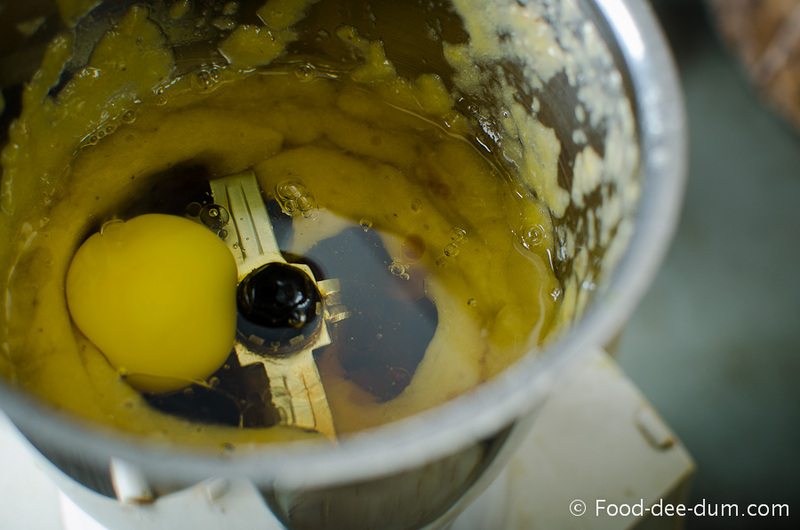 In a mixing bowl, place the pureed bananas, eggs, oil, maple syrup and vanilla extract. Using your hand beater, beat all the wet ingredients on high speed for about 2 minutes or until well combined and pale. Add the milk and give it another quick mix. You can do this step in your stand mixer as well. 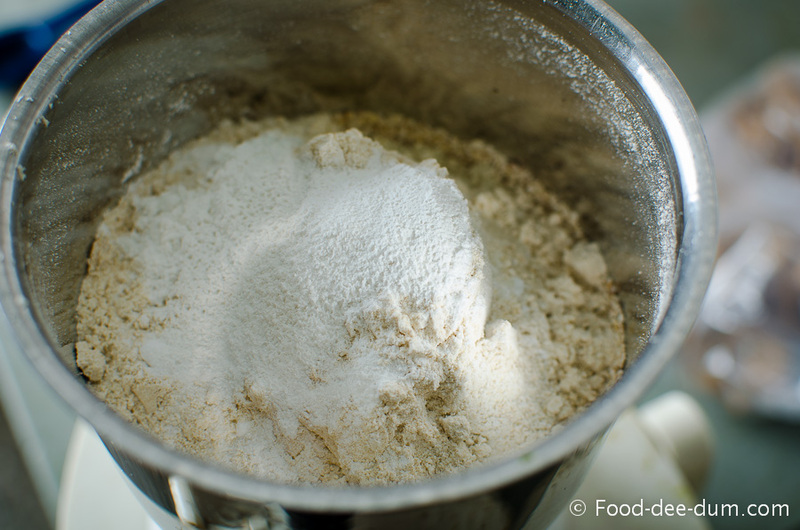 Add the dry ingredients and fold using a wooden spoon or spatula until combined and no flour-y streaks are visible. Add the chopped nuts, reserving a few for topping, and stir. Spoon the batter into the muffin pan and top with the reserved nuts. 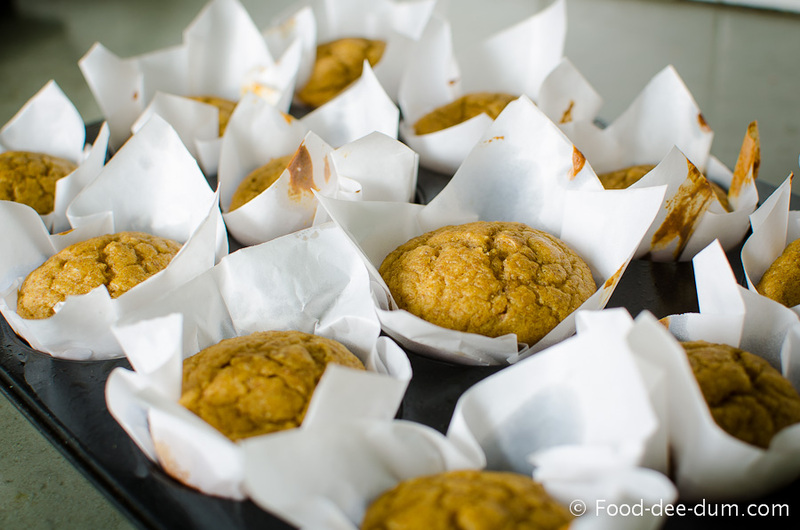 Bake for about 15 minutes or until a toothpick inserted into the centre of a muffin comes out clean. If they are not done at the end of 15 minutes, reduce the heat to 150 C and give it another 2-3 minutes before checking. Remove from the oven and allow to cool in the pan for about 15 minutes. 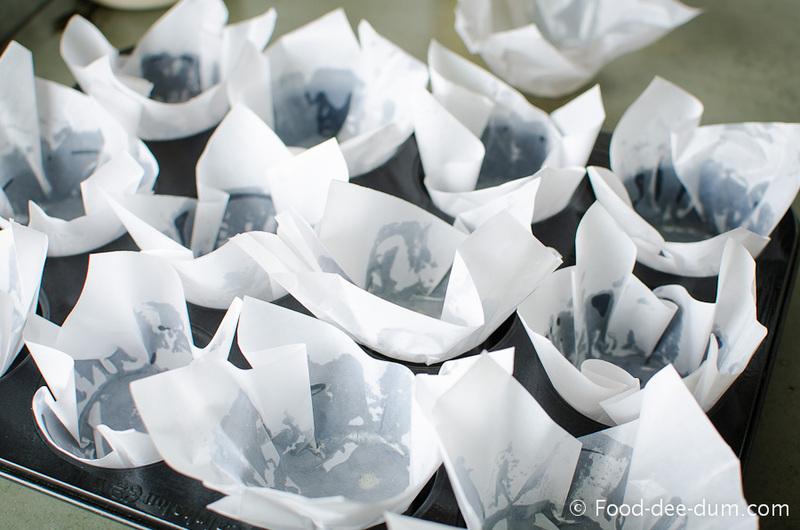 Lift the muffins out of the pan using the liners and stand on a cooling rack to cool completely, about 30 minutes. Consume immediately or transfer to an airtight container and store in the refrigerator for up to 1 week.